1) Request that competitors pick up all their refuse, brass, ammo boxes, etc., before they leave the firing line. 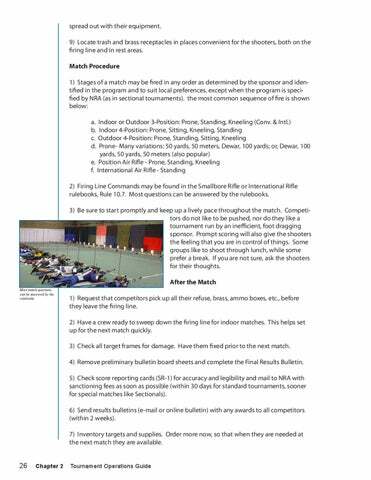 2) Have a crew ready to sweep down the firing line for indoor matches. This helps set up for the next match quickly. 3) Check all target frames for damage. Have them fixed prior to the next match. 4) Remove preliminary bulletin board sheets and complete the Final Results Bulletin. 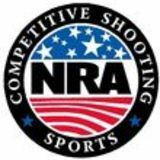 5) Check score reporting cards (SR-1) for accuracy and legibility and mail to NRA with sanctioning fees as soon as possible (within 30 days for standard tournaments, sooner for special matches like Sectionals). 6) Send results bulletins (e-mail or online bulletin) with any awards to all competitors (within 2 weeks). 7) Inventory targets and supplies. Order more now, so that when they are needed at the next match they are available.